The Egyptian Goose pair have reappeared with six small goslings in tow - the first breeding record for Chew (and Avon). Still some late waders moving through - five Ringed Plover, a Dunlin and a Common Sandpiper. A Red Kite flew north over Chew Stoke at 14:22. A male Wigeon and a Hobby were the best birds that could be found today. The discovery last week of a nesting pair of Great Black-backed Gulls was a bit of a surprise, although given their increase in numbers at Chew in recent years and the plentiful supply of dead fish floating in the lake perhaps it's not too surprising. Having said that, an inland pair is perhaps noteworthy. Large gulls formerly bred quite regularly at Chew. In the late 50s and early 60s when Denny Island wasn't the dense woodland it has now become, there was a small colony of Herring and Lesser Black-backed Gulls. There is little published information, so we are left with the typically scant accounts in the local bird reports, which indicate that at least one pair of Lesser Black-backs was still breeding on Denny in 1978. The peak appears to be in the late 50s, not long after the lake was flooded, as the 1958 Bristol Bird Report gives the following account: 'Some 30-50 pairs of L. fuscus and L. argentatus attempted to breed, but eggs systematically collected by BWW Co. staff and only two young seen...'. In fact a breeding attempt by Great Black-backed Gulls would not appear to be without precedent either; the 1956 Bristol Bird Report indicates that a nesting attempt took place, and Somerset Birds says that a pair held territory (but didn't breed) in 1976. Three Hobbies were seen around Stratford hide this afternoon. The male Ring-necked Duck was again in Villice Bay; also at least two Hobbies and a late flyover Redpoll were seen. The male Ring-necked Duck in Villice Bay. (Keith Vinicombe). A small arrival of waders and terns today; one Little Tern, one Black Tern, eight Common Terns, at least eight Dunlin, three Ringed Plover, one Redshank, one Black-tailed Godwit, and also the Ring-necked Duck and the Ferruginous Duck. The male Ferruginous Duck was in Heron's Green Bay today (he appears to have a damaged right eye), along with a Wigeon. The return of a couple of old friends today; the male Ferruginous Duck (Stratford Bay) and the male Ring-necked Duck (Villice Bay). A first-summer Little Gull was also in Stratford Bay. A Turnstone on the breakwater at Nunnery Point was today's highlight; other birds seen were two Hobbies, a Common Sandpiper and a second-summer Yellow-legged Gull. At least one Hobby and two Common Sandpipers today. Two Common Sandpipers at Herriott's Pool were the only birds of note today. We did our first Constant Effort ringing session at CVL today and what was very noticeable was the difference in the Reed and Sedge Warblers. There were 40 Reed Warblers (20 new and 20 retraps); none were carrying much fat and all of the retraps were 'home grown' having been either been ringed this year or in previous years. There were 49 Sedge Warblers (a high number for a single day at this time of year). There were no retraps and the only ringed bird was carrying a Paris issued ring (this will probably have come from the western coast of France that borders the Bay of Biscay and caught during an autumn migration). Of the 48 un-ringed Sedges, many were carrying high levels of fat (typically scores of 40-60 on a 0-80 scale) and our thinking is that these are birds that are still on migration and will be heading further north rather than stopping with us. Almost beginning to slip into the summer doldrums, although a few things of interest seen today: six Black-tailed Godwits, four Common Sandpipers, four Common Terns, and singles of the following: Greater Scaup, Black Tern, Little Egret, Kingfisher, Wheatear, Egyptian Goose, Long-tailed Duck and a Redpoll, unusually a singing bird (very rare to hear them in song at Chew). Things getting back to the usual quiet pace... five Common Sandpipers, three Redpolls, and one each of White Wagtail, Greater Scaup, Hobby, Dunlin and Ringed Plover. More of the same today; the Long-tailed Duck remained, and a Marsh Harrier was seen again. Also seen today were one Yellow Wagtail and one White Wagtail, two Whimbrels, two Common Sandpipers, one Dunlin, a Yellow-legged Gull, a Hobby and an Egyptian Goose. The first-summer male Long-tailed Duck was again in the Stratford Bay/Moreton/Sutton Wick area; the female Greater Scaup was also still present. A record count of 46 Buzzards was made; a single flock circling over the lake. Otherwise, a full clearout it seems; no sign of the shrike or any lingering terns. The first Orange-tips of the year were on the wing at Nunnery Point, and a pair of Brown Hares were on the Parkland. A new month, and a chance to reflect on one of the best Aprils ever at Chew. Not only were there three quality rarities - Woodchat Shrike, Whiskered Tern and Bonaparte's Gull (two of which were new to the lake), there was a fine selection of local and site scarcities as well - Ring-necked Duck, Nightingale, several long-staying Ospreys, four Velvet Scoters, a Ring-billed Gull, a Great Northern Diver, a Long-tailed Duck, not to mention good or exceptional spring passages of Arctic Tern, White Wagtail and Common Sandpiper. 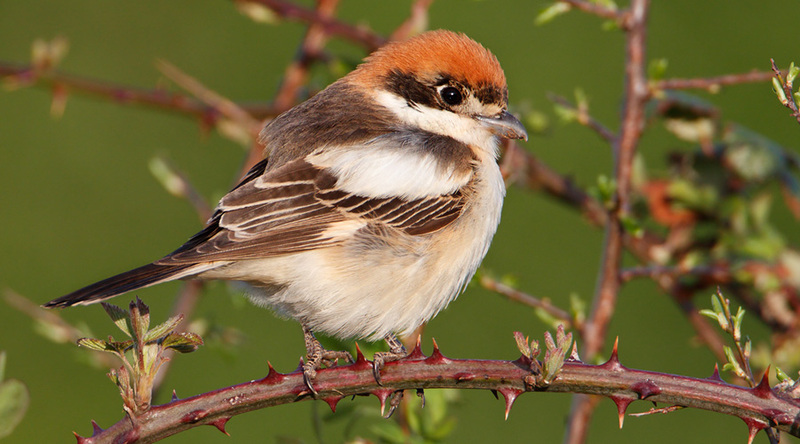 You can see a set of new shrike pics here.